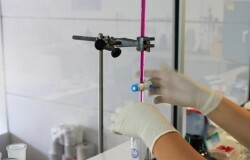 Laboratory of water analysis has state-of-the-art equipment and highly qualified professionals with proven track record. Its main activities are focused on analysis of water for consumption, wastewater, water coming from cooling systems, authorizations for discharges management and characterization of discharges, sampling campaigns and technical advice. Our laboratory has been accredited by the Regional Ministry of Agriculture and Fisherie and works according to the ISO 17025 regulation. It is an accreditation for testing laboratories in an international scale given by the Spanish National Accreditation Entity (ENAC).